Liquid Process Systems, Inc. (LPSi) provides filtration systems that are extremely efficient for cleaning and maintaining the efficiency of heat transfer fluids, thermal or hot oils. LPSi systems are for in-system filtration. Our patented filter housings use proprietary filter elements to enhance optimum cleaning of the oil at elevated temperatures, since they can withstand system temperatures of up to 750°F (399°C). These elements have excellent dirt-holding capacity, are economical and disposable. 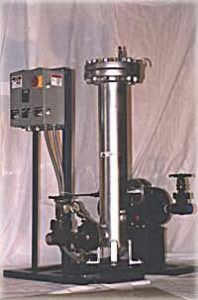 The SENTINEL series offers a complete stand alone system that will re-circulate a portion of the fluid through the filter unit and discharge the clean fluid down stream into the main piping at a pressure higher than the system. More information appears under “Brochures” link above. Call us about renting a thermal fluid filtration system. The VECTOR series offers the same filtering capability except that it uses the existing system pump to recirculate the fluid from the pump discharge through the filter and then to the pump suction. More information appears under “Brochures” link above. All systems are skid-mounted and ready to implement with any hot oil system. All piping, valves and fittings are welded where possible. Units are leak tested and painted prior to shipment.